Let's put it out there. I like Pollen, and mainly it's because of Executive Chef Steve Allen. He's such a nice, down to earth, funny guy who pays a great amount of detail to his dishes. 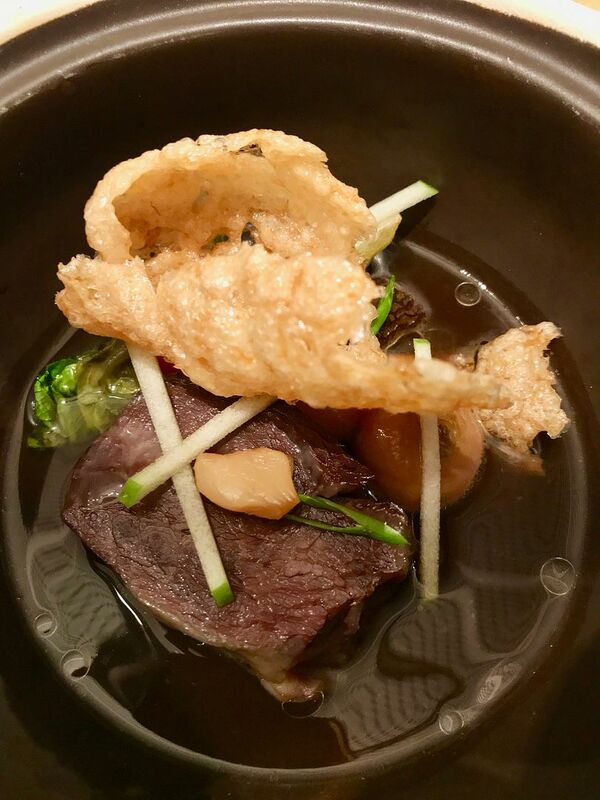 "A dish without a story, is a food without a soul", said Steve. 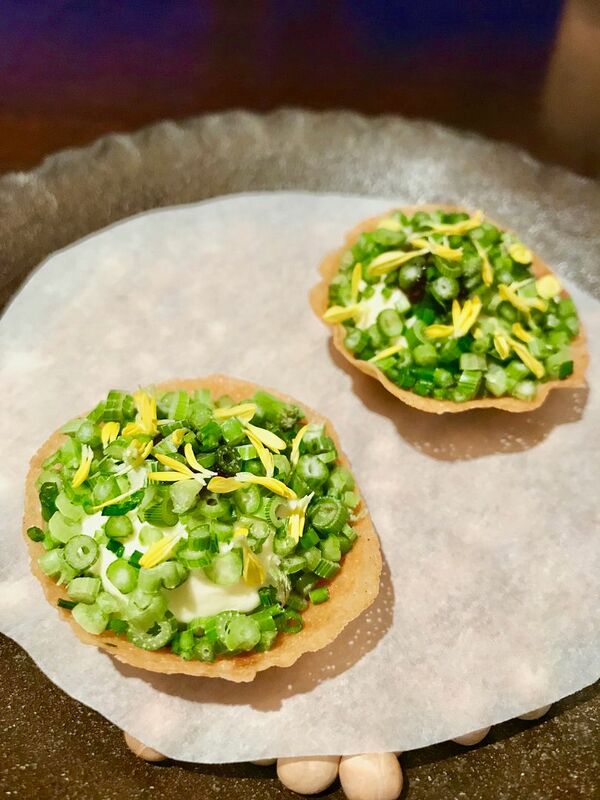 For Pollen's sixth anniversary, he has put together a six course Stories Tasting Menu that tells of his journey as a chef and Pollen's philosophy of presenting accessible and genuine food from the heart. 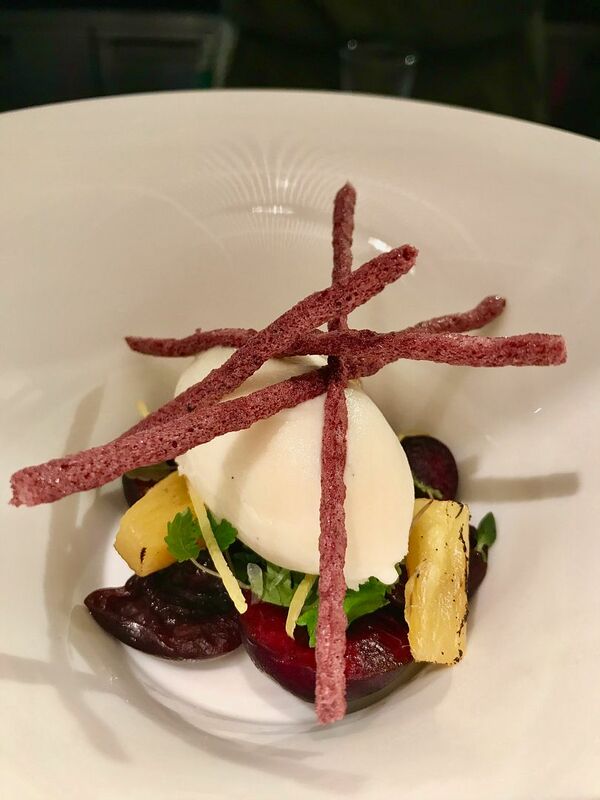 Steve draws inspiration from Southeast Asian chefs and regional agriculture to create his brand of French-Mediterranean cuisine which celebrates the freshness and integrity of produce through simple preparation. He seeks to let the natural flavours of ingredients take centrestage with his dishes. A series of snacks were fired shortly after we sat down. 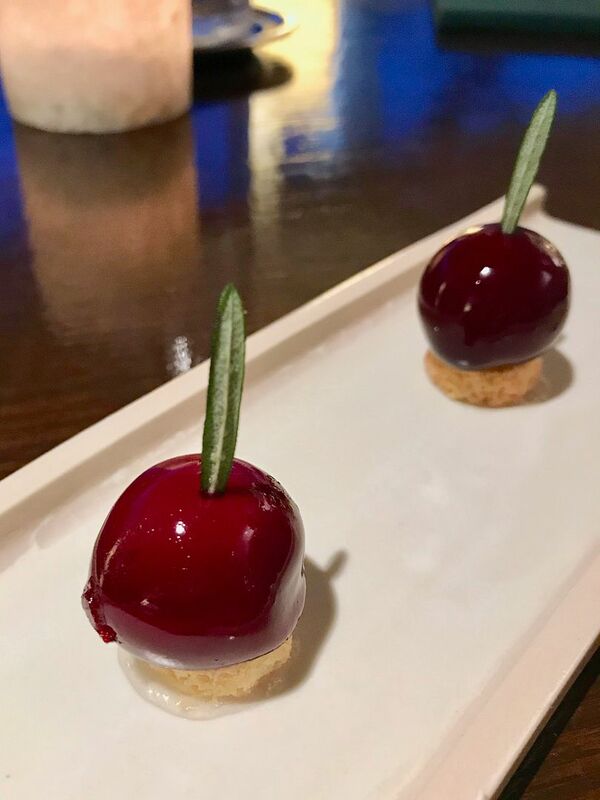 This chicken liver parfait snack has been on the menu since the beginning and probably the only thing that has stayed because Steve loves changing the menu. This has to be the most refreshing egg tart i've eaten. That buttery filo pastry is love and it held a savory egg cream with spring onions and herbs like dill. Strangely, Jr thinks it tasted like Big Mac. We also had another anchovy snack that is wrapped in a leaf and done in the tempura style. The snacks just kept coming and we were starting to feel a little full from them even before the start of the meal. 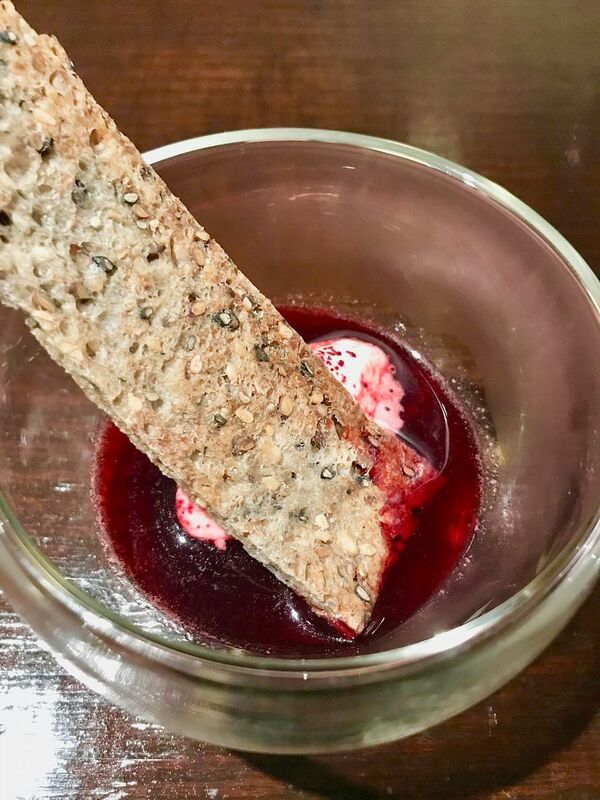 Thankfully, a refreshing sour cream in beetroot and pickled cabbage broth with smoked sausage helped freshen our palate and tummies for the meal. Every meal starts with bread and Pollen has a special "mother dough" recipe for their sourdough made when they opened in 2012. Since then, it is used in the starter to make their fresh bread daily. 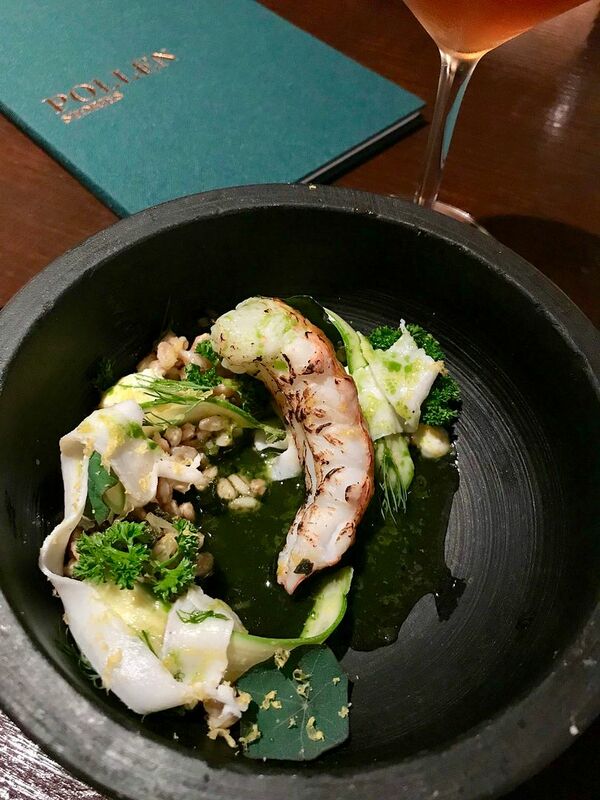 It's not pictured here because i polished it off with their whipped butter with leek oil before i could photographed it. Then, Pollen’s Garden, a Russian salad of sorts according to Steve, made of 16 vegetables done in different ways, with bagna cauda, and topped with a smoking tomato and basil snow. I loved the different textures and flavors in this dish- pickled, raw, baked, compressed, marinated and tempura. It's creamy, tartish, herby and also umami. We heard that the soil is actually made of vegetable peels! For pairing, we had a homemade sparkling "rose" made of rhubarb, basil, and Hendricks gin. The combination of the two certainly left our mouths watering. 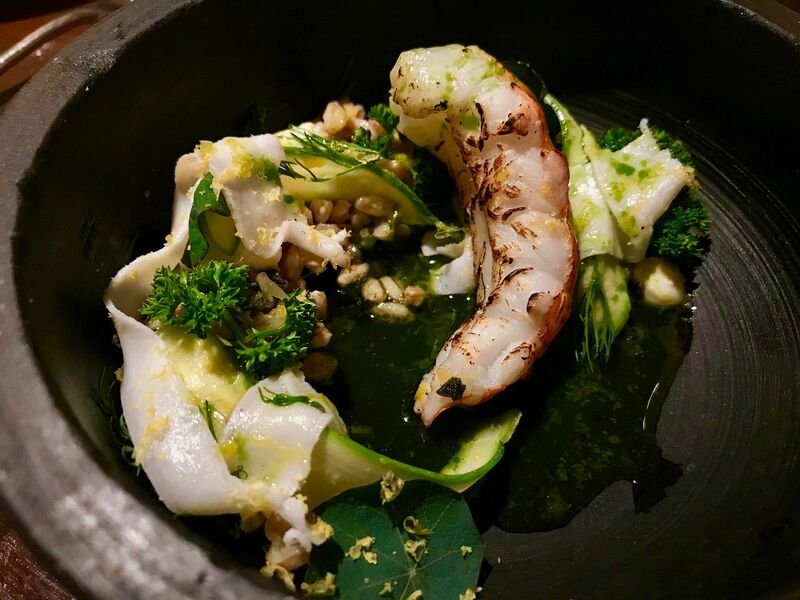 We moved on to Langoustine & Lardo, a dish that is conjured of Head Chef Carmine La Garciola's fond memories from his childhood and family in Italy. 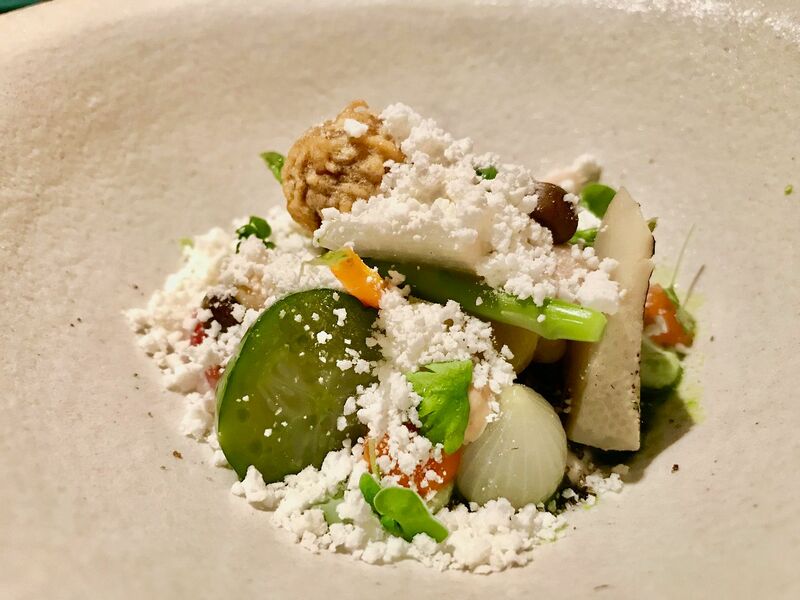 The ricotta used here is the exact recipe that his grandmother taught him as a child and the lardo comes from the Tuscan region. What's lovely is the combination of sweet tender translucent flesh of the langoustine and salty lardo. An acidic herb juice is prepared tableside and poured on the dish. At this point, i thought that citrus and acid could possibly be another main feature of Pollen's menu. Next, Steve's signature dish- Sea & Sand. 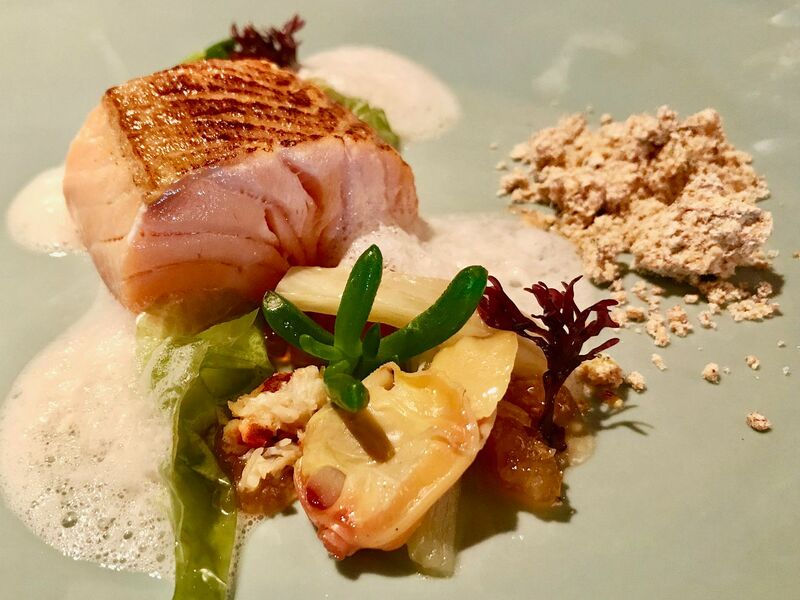 This dish was inspired by his childhood days in Eastbourne, south coast of England, where he would spend his days eating cockles, prawns and mussels from the pier. This pretty plate made us want to visit his hometown. It's not just the presentation of the dish that brought us to the beach, we could even smell the ocean in this one! The plate of perfectly pink salmon, was complemented with salty sweet bites of ikura, crab, and clam. 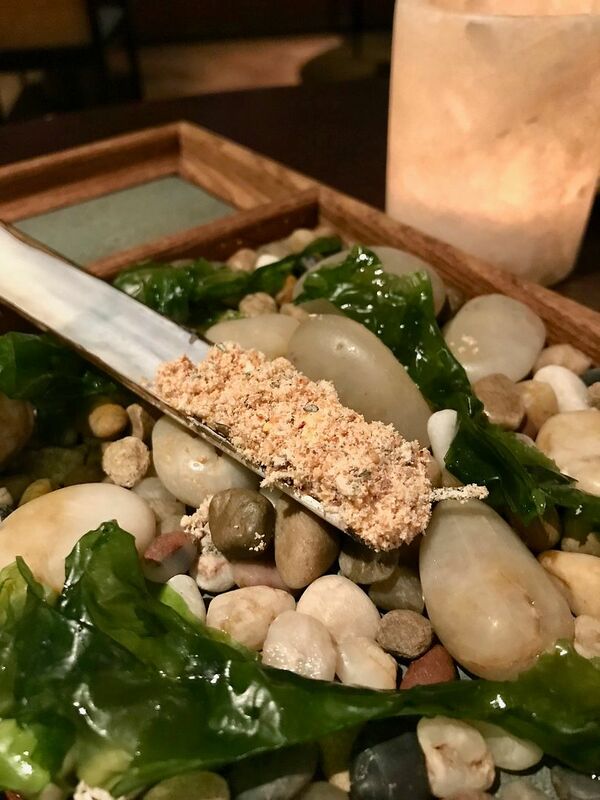 The sand that accompanied the dish tasted like candied furikake but it's made from brown butter solids and a vinegar-sugar "honeycomb". I really loved the sand! The seafood dishes were paired with an Italian orange wine from the region Emilia Romagna made with Malvasia grapes. It's really dry, and tart and it really doesn't taste or smell much like wine imo. There's a very strong diesel nose to it. It's our second time drinking orange and we concluded that it's not our thing. Arriving in Asia is a dish of beef cheek tea, like a ba kut teh but not quite either. Steve's wife is the one who taught him about Chinese herbs and how to use them to enhance certain flavors. This dish is actually Steve's favorite English dish- boiled beef and carrots but with a local twist. We could taste sweetness of the ba kut teh herbs but the soup wasn’t all that herby. 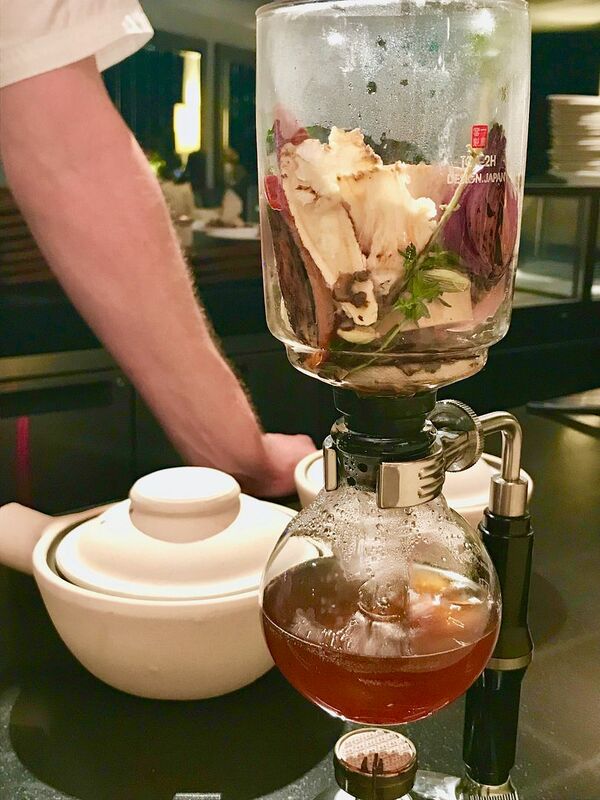 The beef-turnip-herb stock is further infused with Chinese herbs in a siphon before serving. The pairing here is with "Michael Jackson", a Black Cow vodka sour with grass jelly, which was yet another sour drink. 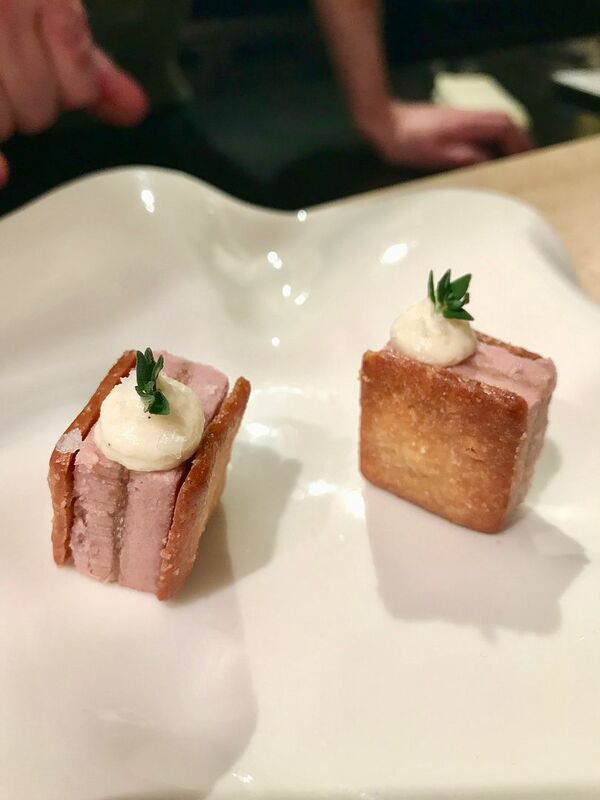 We ended our savory course with Nose to Tail, which featured all parts of the suckling pig. A piece of lovely meat, and a creamy croquette made with all the other parts. This was kinda a symbolic end to the meal and embodies the philosophy of Pollen on food wastage. This is paired with a Pinot Noir from Beaujolais. Finally desserts. We started with a non-traditional English Tea at Raffles which we couldn’t get enough off! 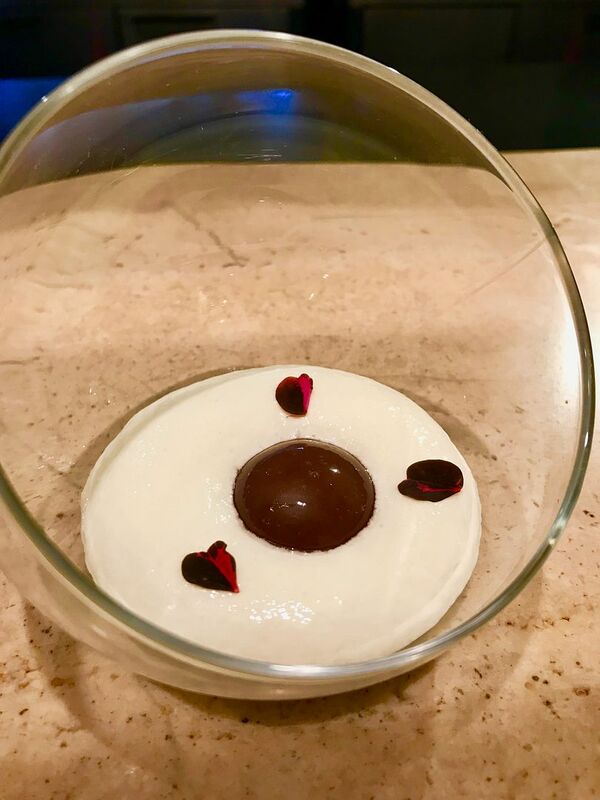 The drink is served cold, with an Earl Grey sphere that pops and mixes with the Osmanthus milk foam. It’s perfectly light and fragrant. The Singapore Sling is an iconic Singapore drink, even though most of us would never ever order this drink. Steve has taken the fruits, herbs, and spices in the drink and made it into 2 desserts- A cherry cream and pineapple jam biscuit, and a sorbet dessert. Both desserts fared better than the darn cocktail IMO. However, we’d have preferred a heavier dessert to anchor the meal but that’s just us. Desserts were served with a Gosnells gluten free Hopped Mead from UK. Love the stories at Pollen and the restaurant is magical. It’s perfect for a romantic date night. Thanks Chef Steve Allen for the wonderful experience and also helping with my wedding surprise for Jr! The Stories tasting menu is priced at $158 for 6 courses and the pairing is $55 for 5 glasses. I’d recommend getting a good bottle of wine for sharing instead.